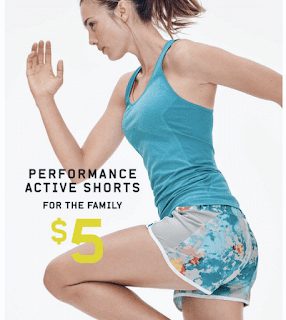 Performance Active Shorts for the Whole Family for just $5 each – offer valid in-store only! Limit of 5 shorts per customer. PLUS, in-store and online, get 40% off ALL Baby & Kids items! And, if you’re doing some shopping online, shop around in the 50% off More Sun Sale to get great deals on shorts shirts and dresses. Make the deals even better, you can score an extra 30% off Adult Styles when you enter the promo code: ENJOY at checkout (excludes Everyday Steals, Hot Deals, Today Only Deals, Clearance merchandise)!